The Cleveland Orchestra, performing in Miami in 2016. The symphony hired the firm of Debevoise & Plimpton to carry out an independent investigation of Preucil; during the course of that work, the team began investigating La Rosa as well. In its announcement, the orchestra said that the investigators had interviewed more than 70 people, and that they had found that both Preucil and La Rosa had "engaged in sexual misconduct and sexually harassing behavior with multiple female students and colleagues over a period of years while employed by the orchestra." In addition, the investigators stressed that the power dynamics between the men and their alleged victims was an important factor. "The abusive conduct by both performers was made possible," the orchestra said, "by their positions of power within the orchestra and in the broader world of classical music." In July, the orchestra suspended Preucil, who then resigned from his teaching position at the Cleveland Institute of Music conservatory within days. The suspension was triggered by a Washington Post report that included allegations against Preucil made by violinist Zeneba Bowers as well as a second, anonymous woman. Earlier this month, two more women, violinists Emilia Mettenbrink and Raffaela Kalmar, also came forward with accusations against Preucil. In three of the four sets of allegations, the women described strikingly similar settings for the alleged abuses: during or immediately after lessons that they were taking with him as a renowned and influential teacher. The investigators say that, during an interview with them on Oct. 18, Preucil admitted to "engaging in sexual contact with three female students during or after lessons," but denied engaging in other forms of misconduct. They also note that Preucil refused to answer a number of other questions, "which largely focused on sexual activity with women who had not already been identified in the press." In the report, investigators say that they have spoken directly with 11 women who "described experiencing sexual misconduct or sexually harassing behavior committed by Preucil," as well as obtaining documentary evidence of a twelfth alleged victim. Moreover, the investigators say that they received secondary reports involving at least eight additional women. The earliest alleged misconduct that was directly reported to the investigation team took place in 1996, and the latest alleged incident in 2007. "Preucil used one-on-one opportunities with female musicians to engage in actions ranging from serious sexual misconduct to sexually harassing behavior," the report states, "including engaging in sexual activity with a junior female colleague who was too afraid to stop the encounter due to Preucil's forcible conduct and position of authority." The report also states that members of the orchestra's executive committee of the orchestra's board of trustees had been approached by orchestral players who were concerned about a allegations about Preucil that were published locally in the Cleveland Scene in 2007 — but that the orchestra did not follow up. In addition, the report says, former members of the symphony's management were aware of the Cleveland Scene allegation, but "did not believe at the time that it warranted further investigation ... or that the orchestra could or should take any disciplinary action against Preucil." Preucil had held his very public position at the orchestra since 1995; the concertmaster holds a leadership role in a symphony that is only second to the conductor. Previous to his arrival in Cleveland, Preucil was the first violinist in the Cleveland Quartet; before then, he was concertmaster of three other notable orchestras: the Atlanta Symphony, the Utah Symphony and the Nashville Symphony. He has also taught at Furman University in Greenville, S.C., the Eastman School of Music in Rochester, N.Y., and the University of Georgia, as well as having engagements with the New World Symphony in Miami and at Indiana University. La Rosa was suspended last month from the Ohio symphony in the course of Debevoise's investigation; an anonymous sexual misconduct claim had been published against him in Inside Higher Ed in 2013. The Cleveland Institute of Music, where La Rosa has (like Preucil) taught since 2007, announced that it had suspended him earlier this month. The investigators say that they spoke with seven women who described sexual misconduct or sexually harassing behavior committed by La Rosa between 2010 and 2012, as well as evidence of misconduct with at least one additional woman. Again, these episodes of alleged misconduct took place during one-on-one music lessons. La Rosa admitted to the investigation team that he had attempted to kiss a female student during a lesson at the University of Iowa, and that he "sometimes touched" students during lessons for what he said were non-sexual, pedagogical reasons. He denied the other alleged incidents, but he, like Preucil, declined to answer many questions, and stated that he could not remember the full names of most of his female students, which, in the investigators' words "negatively affected his credibility." After Inside Higher Ed's publication of the Ohio allegation, the investigators say, two unnamed universities contacted the Cleveland Orchestra to request that La Rosa no longer teach students at their respective schools in private lesson settings. In early 2017, members of the orchestra's management were contacted by the University of Iowa, which told the Cleveland symphony told that La Rosa was barred from its campus. Before joining the Cleveland Orchestra, the Italian-born La Rosa was principal trombonist at La Fenice Opera House in Venice. In addition to his work at CIM and the University of Iowa, La Rosa has taught at many other conservatories and universities across the country, including the Juilliard School and the Manhattan School of Music in New York City and Indiana University, as well as at the New World Symphony. 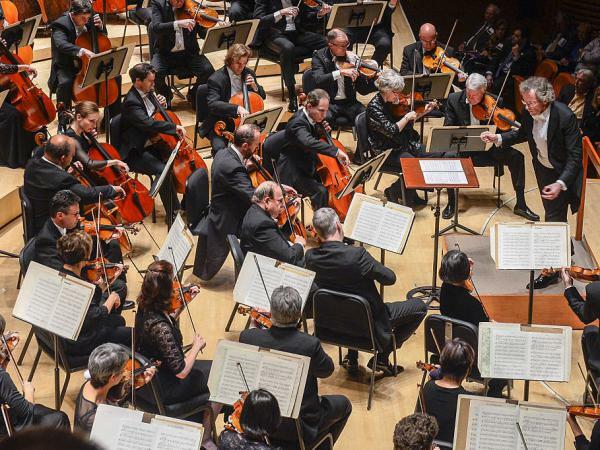 The Cleveland Orchestra says that the investigators have also made recommendations to strengthen its anti-harassment policies.